Hooray it’s time for another Happy Beginnings story! Nothing warms us up from the inside out like reading a story of how Adopt-a-Pet.com helped a homeless pet find a new loving home. (We’d love to hear yours too, and would be happy to consider it for a future blog post too! Send your Happy Beginnings story to info@cms.adoptapet.com with a photo or two.) This week’s story is doubly heart-warming because it’s about two dogs! Here’s what Brandi, a cat rescuer turned dog rescuer and adopter, has to say: “My name is Brandi, not only do I rescue cats, but I always adopt rescue dogs or cats for myself. 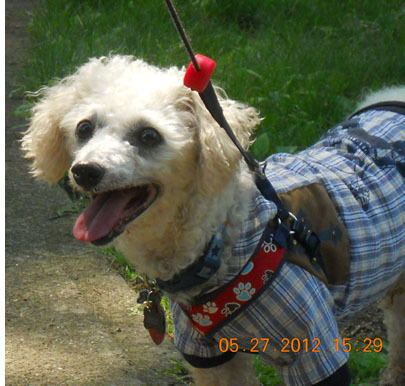 My most recent addition was a miniature poodle named Rudy, who I found through your web site. Poor Rudy was finding it hard to be adopted. He’d lived in a puppy mill for seven years. He was physically and mentally abused. He wasn’t fed much so he took to eating feces which resulted in a mouth full of painful broken and abscessed teeth that ALL HAD TO BE PULLED OUT. His legs were stained from urine burns. He was terrified of all people. He didn’t know what a toy or treat were. He was afraid to bark, go through doors, or walk on stairs. Needless to say, he was passed over at all the adoption events due to his appearance and despondent behavior. His rescuers posted him on your web site and I received an email. His story touched my heart, his picture haunted me. One of my dogs had just passed away and I wasn’t sure if I should adopt another dog yet. BUT then another email came. He’d still not been adopted and I thought what the heck and contacted the rescue through your site. Needless to say, we LOVE RUDY, and are pleased to announce that he heals more and more every day. I truly believe he’d have languished a lot longer had his rescuers not been able to reach a lot of people to share his sad story. Thank you for your wonderful service to all the displaced cats and dogs. I’m a huge supporter of Adopt A Pet .com, and of course, so is Rudy. I love this picture because he looks so happy. Dogs do smile. I’m actually picking up Brutus a Miniature Poodle another rescue posted to Adopt A Pet. I figured I could find him a home for them and I did. Taking him for a spa and hair cut tomorrow and then off to his new home, with my Grandma [he’s a senior who is deaf, and depressed because his owner died and he was thrown into a pound]. Again, because a rescue used your site to network I saw him and he reminded me of Rudy. So he’s off to bigger and better things as a direct result of your services!